A topic that came up during my presentation at the Worship Conference this summer was the nature of beauty. Is it objective, or subjective? Is it in the eye of the beholder? How do you define it? A great deal has been written on the subject of beauty, by numerous authors of different theological stripes. And it's one of my long-term goals to read more on the subject in order to gain more insight. But there are things a Christian can infer from scripture with relative certainty, and depending on your upbringing, they may surprise you. 1. Beauty is not in the eye of the beholder. With so many differing opinions as to what is beautiful, how can I say this with any certainty? The answer is that there is a theological certainty that underlies it: "In the beginning, God created the heavens and the earth... And God saw that it was good" (Gen 1:1,10b). The first reason we know that beauty is not a subjective experience is that God created the universe. He did not create a cloud of unorganized matter that would later produce something that we now refer to as the universe. Rather, it was a creative work that was good from the very beginning. How can a universe made of inanimate matter be either good or bad? The goodness of the universe in the first week of creation refers to its being in order—every molecule was in its place, fulfilling the purpose for which the Creator had called it into being, with no deviation. Every particle of light, every atom, was subject to natural laws that held it in place. And more than being good and orderly, everything was beautiful. That is to say, order and aesthetic beauty are intimately connected. When a person says, "Beauty is in the eye of the beholder," he means that beauty isn't a quality of the object—it is a pleasant reaction of an individual (the subject) to the object. And if this is true, beauty isn't even a real thing, only an abstracted way of saying "I like that." The past century has taught us exactly how useless this subjective notion of beauty has become. There is no so structure so tasteless, no poem so mawkish, no song so insipid, or no painting so offensive that someone won't consider it beautiful. Christians must wholeheartedly reject this abuse of language and distortion of reality. Because there is a Creator, and because he "saw that it was good," we can be sure that there is absolutely such a thing as beauty, and it isn't a figment of our imagination. Our former pastor paraphrased Adam's spontaneous poem to his wife as, "Now that's what I'm talking about!" 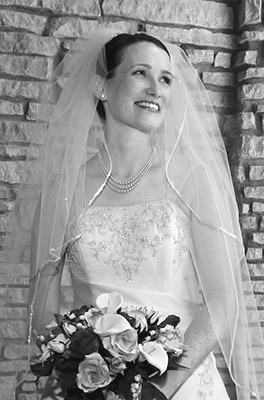 God built into the first man the ability to immediately recognize that his wife was beautiful. Not beautiful in the same sense that the other creatures of creation were beautiful—she was his perfect help-meet, hand-crafted by God to be his compliment in every way. (We might say that Adam's reaction was part emotional-intuitive, and part intellectual.) In any event, Eve was objectively beautiful; Adam possessed the ability to recognize and fully appreciate her beauty, and glorified God as a result. The fact that God created the universe, and that it was created good, are widely denied, even by many Christians. Because if those statements are true, can we explain our present state where no two people can agree on what is beautiful? To be sure, if Genesis 2 was the end of the story, I think the disagreement over beauty would indeed be strong evidence that the Christian view of beauty is wrong. But of course, Genesis 1-2 it isn't the whole story. Every truly Christian view of history must take into account that God created everything in perfection, but that creation is fallen from its perfect state. The Fall into sin and the subsequent Curse (Genesis 3) are responsible for a dual corruption of beauty. The beauty of creation is physically marred by thorns, disease, death, decay. But also corrupted is our ability to perfectly and immediately recognize the traces of beauty that remain. We can no longer agree on whether beauty exists objectively at all, let alone whether this or that thing is beautiful, and neither do we inherently recognize beauty as being a result of God's hand in creation. We have instead found inventive ways to explain how nature might have created itself. 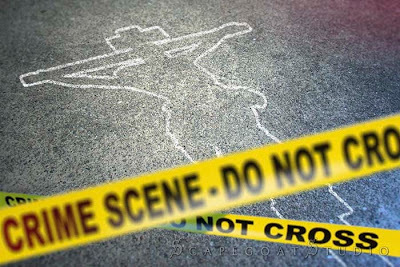 As a result, post-Christian Westerners have nothing to rely on but the chemical reactions and electrical impulses that occur in their brain matter. If my chemical reaction differs from yours, who is to say that yours is right and mine is wrong? And this kind of subjective thought is the crux of Postmodernism: there is no real beauty; there is no real truth; what's true for you is not true for me. Without a knowledge of the Creator, any pursuit of beauty eventually descends into hedonism—sensual self-indulgence. 3. Beauty can be ugly. There is another kind of beauty that I hesitate to bring up, because it further complicates the point I am trying to make. (But art and beauty are complicated topics, so maybe it's best not to oversimplify on this point.) People often talk about something being beautiful whose subject is undeniably tragic, painful, or grotesque. Two things could be at work here. The first is that for hedonists who are looking to be thrilled, any strong emotion will do, even if it isn't a pleasurable one. This would accurately describe horror film lovers and sadists. But the second thing that could be at work is a reaction to the truth of an image. Gibson's The Passion of the Christ did not create particularly pleasurable feelings in me. Watching Jesus be torn to shreds and then be slowly asphyxiated wasn't—visually speaking—beautiful. But many, including myself, found the film to be a beautiful representation of that event. I'm pretty certain I'm not a sadist, and I despise gore. I think the film is beautiful because I knew it to be true on a deep, metaphysical level. The greatest act of love in history was fulfilled in blood and sweat and gore on the cross. No one who witnessed it would ever have called it beautiful. But poets and hymn writers down through the ages have done exactly that—not out of romantic ignorance, but because they knew how true it was. There are many truths in this world that can only horrify us, so a thing does not become beautiful just because it is true. But a particular truth—to be specific, the gospel—has the power to be beautiful and ugly at the same time. Simul iustus et peccator. Strength made perfect in weakness, immortal hidden in mortal, beauty masked in crudeness. It's how God works. Death is never beautiful. But then again, we can say with Job, "though worms destroy this body, yet in my flesh shall I see God" (Job 19:26). So perhaps I have watered down the issue by speaking about beauty in a sense other than aesthetic. But on the occasion that someone confronts the ugliness of the Christian life, or of the cross, you can describe to him the invisible beauty seen by faith in the Son of God. 4. I still can't define it. When I actually sat down to write about it, I found that I know quite a bit about beauty. But I am still no closer to answering the question that was directly asked of me this summer: "What is your definition of beauty?" I can tell you what beauty is not. I can tell you that beauty is something that does objectively exist. I think we can increase our awareness of beauty by studying the arts and sciences. But I can't come up with a bulleted list. The universe is populated by too many beautiful things of a completely different nature to make a list of qualifications very useful. Besides, we're still under the curse of sin, and my ability to see and appreciate all of that beauty is feeble indeed. It's as difficult an endeavor as trying to define truth as a set of characteristics. What would be the point? The things that are true are not true because they share similar characteristics, but because they are... well, true. "Quid est veritas?" We can discover whether some things are true or not. But as far as defining the whole truth? Only God knows. When the question was asked of me this July, I felt like my answer left the group hanging (and probably thinking that I was grasping at straws). When I said that beauty is not in the eye of the beholder—that it's an objective reality—that led some to conclude that there must be a set of finite qualifications. So when I was asked, I stumbled around for a while. I touched on the topics of goodness and order, but I eventually said, "You know it when you see it." Which in hindsight was the wrong answer. When asked about objective beauty, I gave them a subjective answer. The right answer was probably the one that seems most like a cop-out. I should have said, "I can't do it," or "There is no practical definition of beauty that would satisfy a Christian worldview." Or if I wanted to be cheeky, I could have asked, "What's your definition of truth?" Or to grossly oversimplify, maybe I could have said that beauty is God's signature on his creation. Any of those would have been a better answer than the one I gave. All of this just reinforces the fact that I need to study this in more depth. I'm curious to discover what other artists, theologians, and laymen have written about beauty. Maybe they've come closer to the mark than I have. To that end, I'd love input from my readers, too. Are these points accurate? Are there some I missed? I've often lamented the lack of good art in churches (I know: understatement of the year). Ultimately, the lack of art boils down to a lack of artists. Which isn't to say that God isn't distributing that gift as generously as he should—obviously, it would be foolish to find fault with the Almighty. But in my estimation, a good artist has equal portions of two things: God-given talent, and Godly training. A talented artist with no training may not even know he has a gift—it's untapped potential. When it comes right down to it, we aren't actively training artists. We're just waiting around for a harvest when we haven't planted any seed. 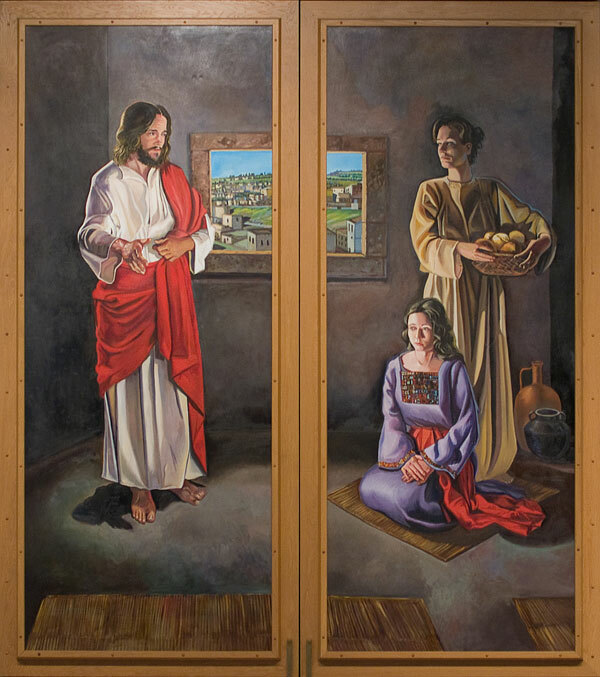 Martin Luther College, which trains all of our WELS pastors and teachers, doesn't offer any studio art classes. They offer two art-related classes: Art Survey and Art in Elementary and Middle School. The first must be woefully inadequate, and the second is geared toward teaching art to lower grades. But it leaves me wondering how people who have no artistic training themselves can teach it to others. If it seems like I'm being unfair—that I shouldn't expect our pastor-teacher training college to invest in art teachers and art curricula when synod resources are already stretched so thin—you're right. MLC isn't a liberal arts college. But it will always be the case that our resources are stretched too thin. 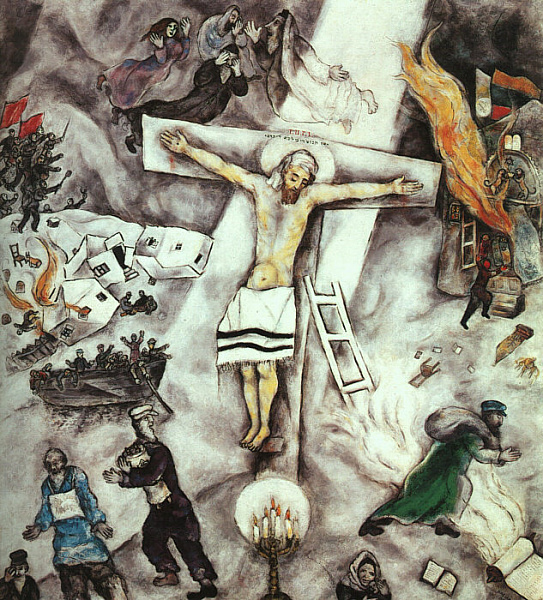 Even if the synod had a surplus of resources, the visual arts tend to fall exactly at the bottom of their priorities. I'm not saying let's prioritize art above theology or hermeneutics or Hebrew. But is there room somewhere between music and basketball for that which our Lord and the church have valued so highly? Based on the level of investment in the visual arts at our teacher training school, it's little wonder that the majority of our WELS schools don't have art programs beyond craft paper and popsicle sticks. What if our Lutheran elementary and high schools were even half as serious about art education as Luther was about music education? The worst that could happen is that within a few decades our laity would find themselves being less ignorant and apathetic about the arts. But the best outcome would be a steady crop of talented artists emerging, beautifying our churches, focusing our eyes and our worship on Christ, and instructing Christians through the visual arts. Why should the devil have all the good artists? Guess who is doing a great job producing artists? The Latter-Day Saints. 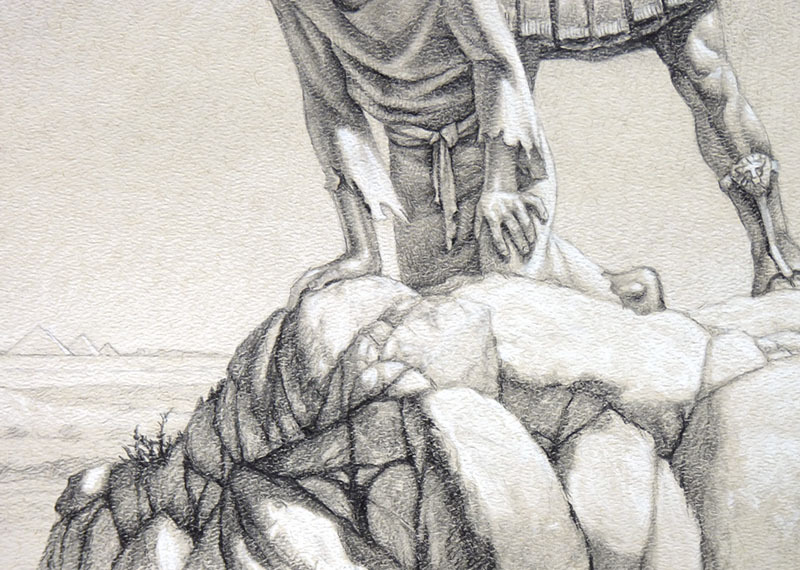 I don't know what they are doing right, or where they are all coming from, but if you're searching for high-caliber biblical illustration, chances are about 1 in 3 that it's by a Mormon artist. (Full disclosure: I made up that statistic.) After the illustrious Arnold Friberg, there seems to have been a steady stream of realists coming from Utah ever since (e.g. Walter Rane, Jeffrey Hein). And, frankly, some of it is kitsch (e.g. Greg Olsen). But kitsch or not, it's talent largely wasted, as the LDS church buys the copyright for those beautiful works to use as propaganda for its teachings. There are few artists in the world (let alone in the Lutheran church) who possess the technical mastery of some of these artists. To me, that's a little embarrassing. Just so you don't get the wrong impression, I don't judge artists purely by technical skill. Nor is realism the ultimate measure of artistry. 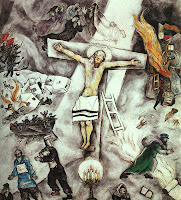 The Lutheran artists I know of are more creative, are better at symbolism, and teach pure theology with their art (e.g. Edward Riojas). Which, in my estimation, makes them better artists all around. So to be fair, we need to see the positives, too. Lutherans are not doing poorly across the board. Bethany Lutheran College is doing an incredible job training artists. (Full disclosure: it's my alma mater.) I can't say exactly where I would be artistically if I had gone to school elsewhere, but I give Bethany much of the credit for the artist that I am today. BLC has a small but passionate art department that is making a perceivable impact within our fellowship. 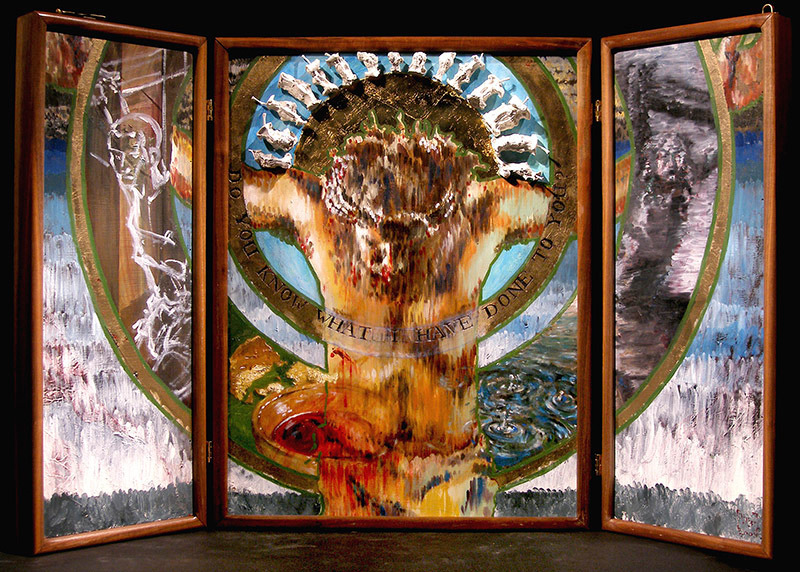 More than that, Bethany's Trinity Chapel includes stained glass and a huge altar painting by Bill Bukowski (even before altar paintings became cool). To me, that says that they don't just encourage artists to act out their faith—they put their money where their mouth is. The chapel embodies the idea that art can be as valuable a contribution to worship as music. In short, Bethany molded, taught, inspired, and pushed me to be the artist I am today. This isn't intended to be a commercial for Bethany. Because frankly, if you wait until you're an adult before you decide to pursue some kind of formal artistic training, you've already lost precious years. If you're a parent who sees artistic potential in your child, let him pursue the gifts God has given him, and don't worry about whether you think he'll be able to support himself. That's God's job. Besides, in hard economic times, I think we place far too much emphasis on a four-year degree. A private liberal arts college isn't exactly the most cost-effective way to get artistic training. I think a major part of the solution to the artist shortage is to start providing artistic training at a young age. Not just for those who think they want it, but for everyone. Make it a standard part of your curriculum, and invest in it the same way you would in math, history, or science. And at the very least, get children into an honest-to-God art program by the time they're in high school. 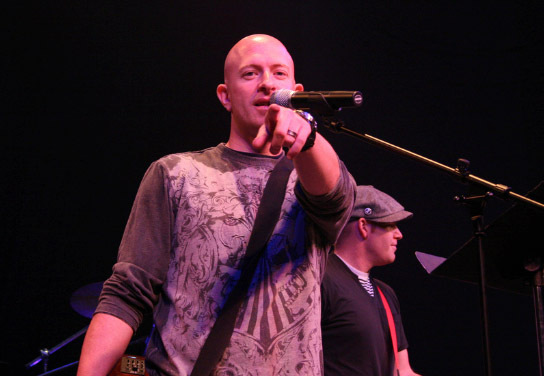 Minnesota Valley Lutheran High School has the talented Jason Jaspersen in their employ. Jason, another Bethany grad, has been teaching art classes there for 14 years. I envy his students; I wish that I had had an art teacher of his caliber in high school. As much as young artists need a skilled and experienced teacher, they also need a wise mentor. Jason has those qualities, and it's not hard to see in him the kind of traits ascribed to Bezalel in Exodus 35. Under Jason, the art program at MVL has blossomed into a program that, for some students, is the highlight of their high school education. Some would say that the art program is one of MVL's strongest suits. I say, good for them! Go and do likewise. Parents and students have a lot of pull at schools—probably more than they think. Make inquiries, talk to your school administrators. Talk to other parents, and make a coordinated effort to get art programs established in our schools. Not just because your child may have a gift—which would of course be wonderful—but because our synod desperately needs your child. Even if he doesn't turn out to be the next Jason Jaspersen, we need laymen who have an appreciation of the arts. And by that, I mean a hands-on, historically informed appreciation. As opposed to "Oh, yeah, I liked that picture of a beach I saw at a hotel once..." Your child is our only hope! Take charge of the future of our church. Invest in your children, and God's kingdom will reap the benefit. God's Not Dead: Fictitious "Gotcha"
As other writers have pointed out, the film is not all bad. Most of the good things reviewers have pointed out deal with the high production value and market success of a Christian film. They also recognize that it attempts to share the gospel, and that is an admirable goal. I don't think any Christian wishes to detract from those things. But it does have some glaring problems, which should give Christians pause before endorsing a film—especially if endorsing it for evangelism purposes. For this review, I want to zoom out and discuss primarily the basic premise of the film. 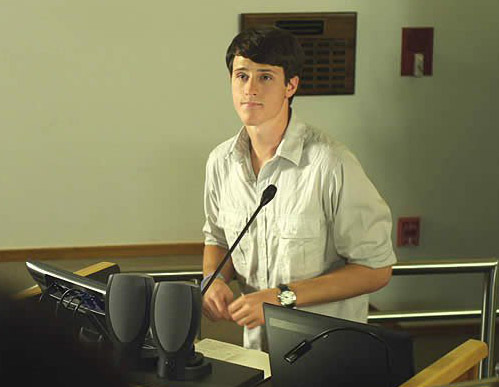 The movie promos claim that while the protagonist of the movie, Josh Wheaton, is a fictional character, his story is true. It's true only in the sense that Christians are being persecuted in colleges and universities. But aside from that, major portions of the movie were so far from believable that at points they bordered on comical. Josh Wheaton is confronted by a spiteful Prof. Radisson. Likewise, it is believable that a student of conscience would stand up to such academic bullying, even under the threat of failure, because that is what Christ has prepared us for. The extra features on the dvd spotlighted some examples of real students undergoing persecution for their faith, e.g. being threatened with expulsion from a graduate program for refusing to counsel a lesbian couple. Christians are undergoing persecution for their faith in America in quiet ways that will never make the headlines. In that respect, this movie is good in that it shines a spotlight on a real problem. But the believability stops there. The atheist philosophy professor, Radisson, gives Josh Wheaton the chance to defend God's existence in front of the class, presumably to embarrass him. He gives the freshman three 20-minute blocks of time to prove that God is not dead. After that time, we are asked to believe at least three unbelievable things: 1) that all 80 of Josh's classmates were convinced of God's existence, 2) that the professor who wanted to destroy Josh's faith would allow himself to be lectured and even bullied by his student in a contest that Radisson himself controlled, and 3) that shortly after being so humiliated, he would convert. The cause of my incredulity is not that I don't believe in the miracles, or that I think the Holy Spirit is incapable of converting a room full of unbelievers. But when you consider that Josh's arguments were weak, that he tried to use evolution and the big bang as proof that Genesis was correct long before science caught up with it (huh? ), and that he never mentioned Jesus once... well, there's no reason why any skeptic should take his side. And without the Word, there's no means for the Holy Spirit to work in the hearts of his classmates. Despite all this, one particular classmate tells Josh after the final debate that he wants to follow Jesus now. Assuming that the one prior on-screen conversation they had was their only interaction, all he could possibly know about Jesus is that he is Josh's friend. The entire premise of this movie smacks of those Christian email forwards and Facebook memes in which a young student poses some clever arguments to a science teacher who unwisely tries to argue for God's non-existence. One boy asks the teacher if he has ever seen his own brain, thereby demonstrating that we can know something exists without being able to observe it. They always purport to be true stories. One version suspiciously claims a young Albert Einstein to be the child in the story, but the rest use no names or places—sure indicators that they are fictitious. They are intended to give us that satisfying "gotcha" feeling that Christians will likely never experience in the real world. Unbelief is not won over by clever arguments. It refuses even to be embarrassed. Josh makes his final case. Images courtesy of Pure Flix. Last week, I had the privilege of doing some door-to-door canvassing with a gentleman from my congregation who has been doing it weekly for almost two decades. (His partner in evangelism was recently called home to his Savior.) Someone once asked them how many new members they had gotten as a result of their efforts. They replied confidently, "None." Why bother then? They answered that Jesus tells us to preach the good news. He doesn't seem to care how many people walk in our door, so long as the seed is scattered. It's as simple as that. Really, the answer is love—love for Jesus, who redeemed us, and love for the unconverted, who need God's salvation as much as we do. So... can we do better? I suggest that a movie that depicts the reality of Christians being persecuted, even killed, for their faith would be much more compelling than a sanitized, Hallmark version of Christian conflict in which faith turns all the bad guys into good guys. Look at what's happening to believers in Iraq at the hands of ISIS. Or in Syria. 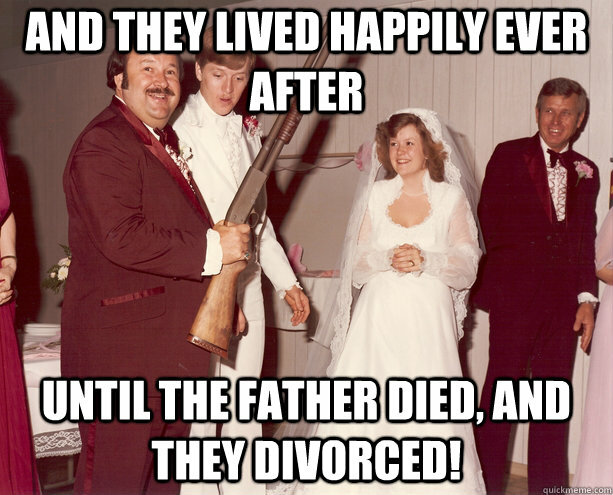 There's plenty of evidence there that Christians aren't getting happy endings. To be fair, the film does show a girl who converts to Christianity from Islam and is thrown out of her home. But that thread is left unresolved, with an artificial happy ending appended to it. A Christian film cannot claim to have added anything significant to the case for God's existence unless it can tackle the problem of pain head on and not flinch. Many of Jesus' own apostles met gruesome deaths. Where's the comfort in that? Where's the "gotcha" moment? Their comfort was in a Savior who was delivered over to death for their sins and raised to life for their justification (Ro 4:25). They didn't need the satisfaction of knowing that they had won an argument over God's existence. I suppose the only real "gotcha" moment a Christian can experience will be the Second Coming—but then, I highly doubt that when we see the Son of Man coming on the clouds of heaven with power and great glory (Mt 24:30) our reaction will be, "Ha, atheists! We were right all along." No, I think that terrifying event will drive any hint of arrogant gloating from our minds. We'll have far more glorious things to think about. I suggest that instead of constructing fictional "gotcha" moments for Christians to bask in, we should instruct them in biblical teaching about evangelism, the theology of the cross (of persecution), and apologetics. We can encourage and equip them with Christian community. We can hold up examples of faithful Christians who have carried out their calling, even sometimes to bitter ends. And we can offer prayers to those who are witnessing every day in the mission fields—those far away, and those in our own back yards. And as always, we would do well to remember that we are called to scatter that seed as well. "Here am I, send me, send me!" Ad Orientem or Versus Populum? Liturgical variety can be a wonderful thing. It is proof that Christians are not a homogenous body of cultists, but the wonderfully varied Body of Christ, expressing their faith in a spectrum of languages, cultures, and rites. That isn't to say that all variety is welcome or desired. I think any Christian would accept that while variety can be good, it is necessary to strive for purposeful and meaningful variety. In worship, we don't usually do things arbitrarily or at random, because randomness cannot serve the purpose of the gospel—or any purpose. During the WELS Worship Conference this summer, I had the opportunity to see one particular aspect of liturgical ritual put into practice. Though the altar was freestanding, the altarpiece that I designed for the Festival of Transfiguration made it impossible for the liturgist to stand behind the altar and face the congregation (versus populum). Apparently, not all parties involved were aware of that practical necessity until the night before, and I took some heat for it. But regardless, it was decided that the liturgist would have to do parts of the liturgy ad orientem (facing liturgical East), which has been almost universal church practice for centuries. It isn't my intent to tell Christians that this is how the liturgy must be done, or that they should get rid of their freestanding altars and build high altars. But every action of the priest/pastor, every liturgical response, every symbol is a teaching opportunity. So I'm only advocating that we take the opportunity to ensure that the orientation of the pastor isn't an arbitrary decision (i.e., well, that's how it was always done in my church), but one with meaning. For instance, this was the first time that I became acutely aware of how appropriate it was for prayers that are addressing Christ to be made facing the altar and Christ. The symbolism is somewhat fractured when you have portions of the congregation facing in opposite directions, but imagine a church with a longitudinal nave. 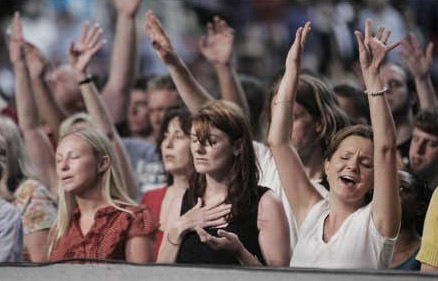 The pastor faces in the same direction as the congregation, because it is their prayers he is carrying to Christ. It is sometimes said that ad orientem should only be used in conjunction with a wall altar, and versus populum should only be used in conjunction with a freestanding altar. I would advocate neither. Lutherans have often taken up the practice of facing the altar during the sacrificial portions of the service (prayers, canticles) and facing the people during the sacramental portions (the absolution, the words of institution, Scripture readings, benediction). This can be done whether using a high altar or a freestanding one. Again, consider the appropriateness in context: the minister says, "In the stead and by the command of Christ, I forgive you all your sins, in the name of the Father, and of the Son + and of the Holy Spirit. Amen." He does this facing the congregation, but standing between the congregation and the altar, representing his role as mediator and vicar of Christ. I think it is an unfortunate development in the post-Vatican-II environment that the pastor feels obligated to always stand behind a freestanding altar and speak the entire service towards the congregation. On non-Communion Sundays, the altar serves little more purpose than a podium or hymnal stand. On Communion Sundays, it gets promoted to table. Here we retain the vestments, altar, candles until they are used up or we are pleased to make a change. But we do not oppose anyone who would do otherwise. In the true mass, however, of real Christians, the altar should not remain where it is, and the priest should always face the people as Christ doubtlessly did in the Last Supper. But let that await its own time (AE 53:69). But the Lutheran church didn't take this opinion very seriously, it seems, because it retained wall altars and ad orientem as the norm in the intervening centuries. Perhaps it valued the symbolism of the priest facing the altar, or perhaps it thought that corporate worship in general should not strive to model itself after the informal meal atmosphere of the Last Supper. A third factor could have been that ministers in the Reformed churches spoke the Words of Institution versus populum with their backs to the elements, since they had no doctrine of the Real Presence. (Lutherans obviously would have wanted to distance themselves from those who didn't acknowledge the Real Presence.) But regardless, we can say without reservation that Luther was only human, and that his opinions were not meant to be made into rubrics, as Luther himself hints in the above quote. Simply put, the Church's traditions are bigger than one person. Christ has given his members the freedom to make innovations to worship that are born from the gospel. Certain innovations have been weeded out over the centuries as being harmful and contrary to scripture (e.g. the agape meal, the Canon of the Mass). Others have been good, and our fellowship has kept them. Whatever your church practice is, I would only suggest that you strive for ritual that is meaningful. See that it communicates truthfully to your parishioners, and that they understand what is being done, and why. Finally, may Christ be glorified in all things! Amen. The 2014 WELS Conference for Worship, Music, and the Arts concluded last week on Friday. We're finally getting back into the daily grind. 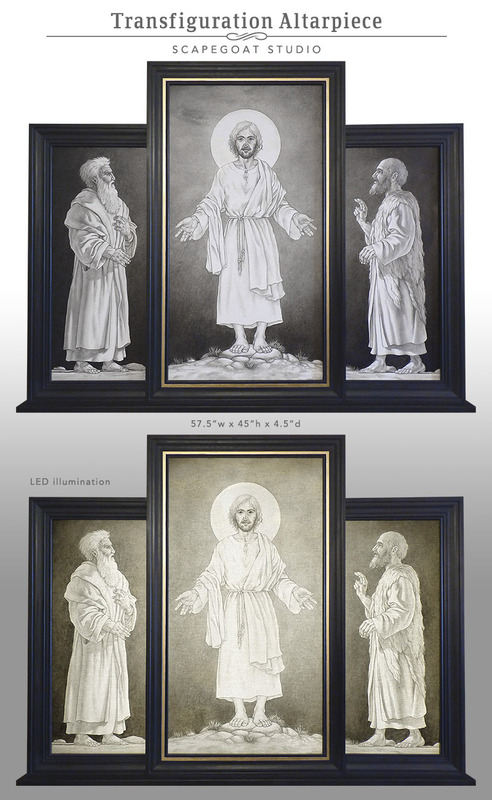 This triptych was designed and painted especially for the Transfiguration service at the conference. 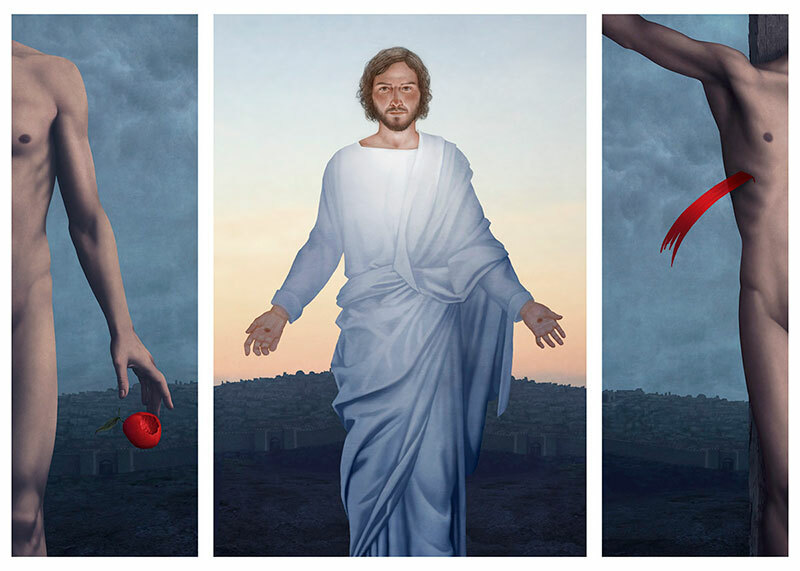 Since it has fulfilled that purpose, I am now offering the triptych for sale. If you know of anyone who might be interested, please pass this along to them. Price: $1200 with lighting; $1000 without. Oil on muslin, with poplar and pine frame; LED lighting, power adapter, and dimmer switch. The altarpiece also has two legs and a cross bar (not shown) that were used to clamp the frame to the altar at Carthage. These can be removed to fit whatever installation needs you may have. If you are interested or have any questions, contact jonathan@scapegoatstudio.com or message me on Facebook. My two-year-old son has been learning "Jesus loves me, this I know," and because it's one of the only songs he knows, he sings it all the time. I noticed the other day that he keeps getting one of the lyrics wrong. The original goes, "Little ones to him belong; they are weak, but he is strong." In Gabriel's version, it gets changed to "He be weak, but he is strong." I don't have the heart to correct him, because the version he sings is also true. When we think about Christ this Lenten season, it is not in the context of some lamentable tragedy. Jesus was not the helpless victim, but the willing sacrifice. When we see Jesus being nailed, beaten and bloody, to a cross, it is easy to see his weakness. It is hard to see his strength. It is hard to see the God whose "strength is made perfect in weakness" (2 Cor 12:9). The very idea of an omnipotent God going willingly to this kind of death is absurd in the extreme. It's incomprehensible. It's foolishness. Christians must recognize this, especially since the Apostle Paul even calls it such. "For the message of the cross is foolishness to those who are perishing, but to us who are being saved it is the power of God" (1 Cor 1:18). You've probably seen this meme floating around the internet. 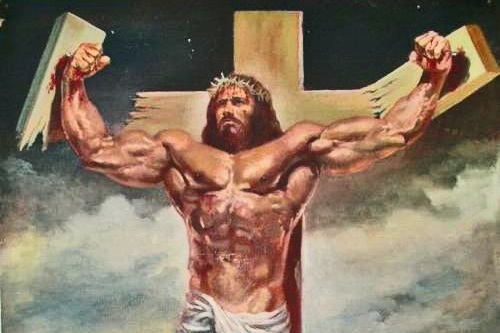 It shows a muscle-bound Jesus defiantly snapping the arms off the cross. It reads like a deleted scene from "The Last Temptation of Christ," in which Jesus decides your sins are not worth it and uses his power to do exactly what his tormentors demand. It's meant to satirize the absurdity of the central article of Christian faith. In my last post, I shared a drawing of the Temptation and asked for readers to point out the symbolism. In this post, I'm going to explain the different symbols that I incorporated into the drawing. I don't always do this. One reason is that I don't want to deprive the viewer of discovering these things for themselves. A work of art becomes more impactful and memorable if the viewer has to work a little at it. That "aha!" moment becomes a reward in itself for the observer who invests a few extra minutes in the work of art. But there is also a trade-off. If I don't explain the work in my own words, sometimes things that I think are obvious will be missed, or a viewer will put a different spin on it. In this instance, a viewer found the words "I AM" written in the rocks, which I had not at all intended to write. 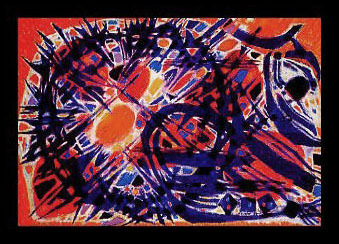 Some symbols do not communicate as clearly as they might, and this is a problem inherent to the visual arts. So with that being said, the following is a brief explanation of "The Temptation of Christ." Satan: In my previous approaches to this subject, the devil had been a shadowy figure dressed in a tattered black robe. Some years ago, I decided a change in costume would be not only less cliché, but more appropriate. I thought, why shouldn't Satan be dressed as Caesar in all his glory? 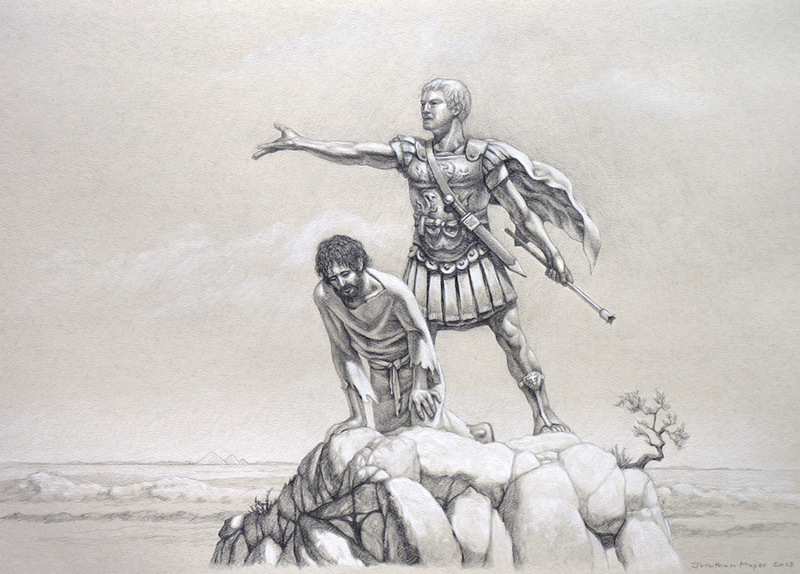 Satan claimed to own the entire world—as the caesars did—and he also asked that Jesus bow down and worship him—as did Domitian and other Roman emperors. The symbolism didn't have to be invented, since it is already well-established in Roman art. 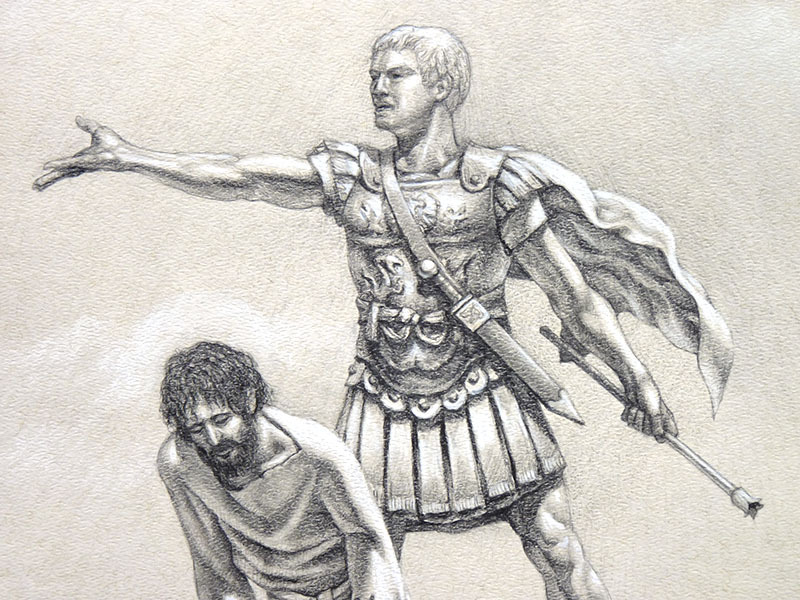 So I dressed Satan as Caesar, wearing a sword as a symbol of his warring conquests. He holds a scepter in his hand, symbolizing his dominion over the earthly kingdom. His posture indicates his arrogance and vanity as he gestures toward the kingdoms of the earth and their splendor. The Lion: The devil is described as a "roaring lion, seeking whom he may devour" (1 Pet 5:8). There are lions emblazoned on Satan's sandals and in the center of his breastplate, an appropriate symbol of his power and bloodlust. The Dragon: The book of Revelation describes Satan as "the great Dragon...that serpent of old" (Rev 12:9), which brings to mind that first deception in the Garden of Eden. He wears the symbol of a dragon embossed on his breastplate as a boast: "Look what I have done to God's perfect creation!" The Tree: The devil's scepter points to a stunted and withered tree, which brings to mind the Tree of the Knowledge of Good and Evil—the means by which he overcame mankind by introducing sin into the world. But Satan could little guess that a tree would also the means by which Jesus would overcome him. Jesus: Jesus is in every way Satan's opposite. He is the picture of humility—the Suffering Servant. His back is bent, his hair unkept, his clothing torn, his eyes downcast, and he doesn't appear to have the strength to even stand. He is facing away from Satan, and he shows no interest at all in his grand offer. Instead, if you follow his downcast gaze, it is focused on some cracks in the rock which resemble a body hanging on a cross. Jesus was ever conscious of his mission, and solely motivated by love. He resisted each temptation, maintaining his divine perfection—only hinted at here as a thin cloud which forms an 'accidental' halo over Jesus' head.